Good morning from very rainy Hamburg and welcome to our first Daily FX Report of this week. The USD fell against its most counterparts but could recover against the EUR. However, we wish you a successful start in this week. The USD fell against 10 of its 16 major counterparts on speculation that retail sales fell in September and factory output cooled last month, adding to signs the U.S. is likely to trail other countries in emerging from recession. The USD reached against the EUR 1.4738. In the U.S. are speculations that the USD may fall versus the EUR before the U.S. reports this week that they are set to show the recovery in the world`s largest economy will be slowing, backing the case for the Federal Reserve to keep interest rates low. The EUR was close to a two week high against the JPY and reached 132.42 before a German report may show tomorrow that the investor confidence could rose to the highest level in three and a half year. The USD fetched 89.86 against the JPY. The GBP dropped against the USD to 1.5915. The GBP made also losses versus the EUR and reached 92.68. Furthermore the GBP posted a weekly drop against the EUR as a report showed that the producer prices jumped last month more than economists predicted. Since the beginning of September, the GBP has been trading in a bearish trend against the USD. 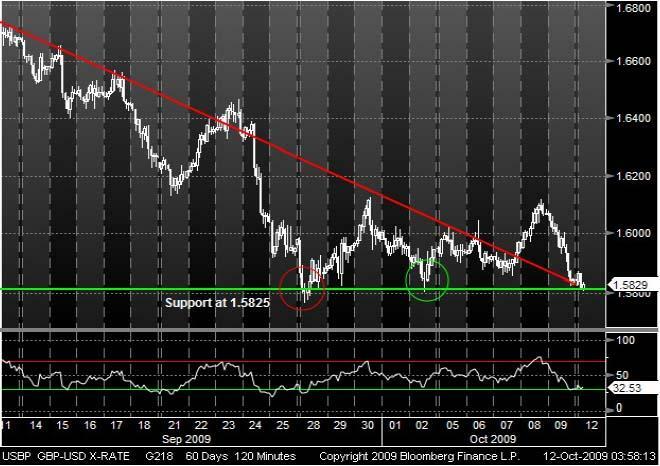 Now, the GBP touches its support line at 1.5825 and it seems that the support is strong enough. When the currency pair reached its support two times before, it could recover. Also the RSI may indicate a rising trend so that the GBP could start a bullish phase versus the USD. During the last two month, the EUR has been trading in a bearish trend channel against the NZD. Right now, the EUR reaches the upper line from the trend channel. Whenever it touched or crossed the upper line for a brief moment, the prices rebounded. Also it seems that the Momentum will cross the signal line from above which may indicate a continuing bearish trend. 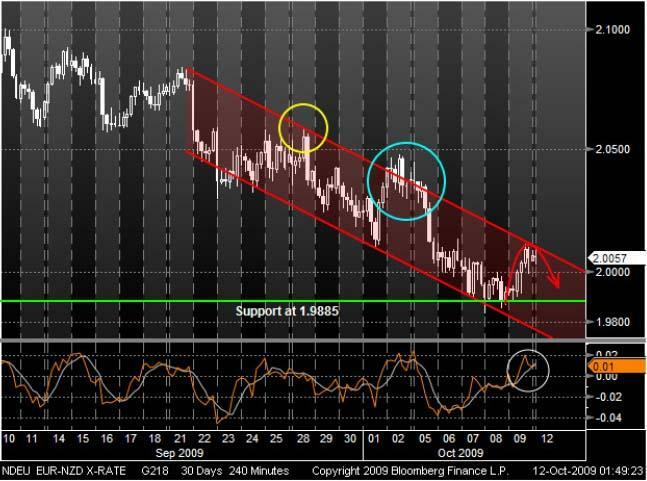 The next support could be around 1.9885.